New England Vacations could be a romantic weekend getaway at a quaint inn on the rocky coast of Maine, an exciting trip to the historic city of Boston or a girls weekend in the charming harbor town of Newport Rhode Island. In 1614, English explorer, John Smith, sailed along this coastline and named it "New England". The Mayflower landed at Plymouth Rock in 1620 and the English Puritans set up the first colony. Picture quaint historic towns with white steepled churches, charming seaside villages, rugged coastline and craggy mountains. This is beautiful New England....often called the Cradle of American Civilization. There are many sights to see, cultural attractions and museums to explore and history to experience in this favorite vacation area of the United States. Choose romantic New England getaways for an anniversary or honeymoon. Summer brings Cape Cod beach getaways, trips to explore the rugged Maine Coast or a Newport Rhode Island vacation of sailing and outdoor fun. Fall is a favorite time for New England Getaways with peak color being from mid-September to mid-October. Spring in Boston is gorgeous with the magnolias and forsythia blooming or in Newport with the lovely rhodedendrum. Winter getaways include skiing in New Hampshire or "cozying up" at charming historic Bed and Breakfasts for romantic getaways in New England. Boston Logan Airport is the most convenient if you are exploring several different areas of NE because of its central location. There are also major airports at Providence RI, Portland ME, Manchaster NH, Burlington VT and Hartford CT.
To check for the best airfares to cities in New England, you can check this search engine by entering your departure city and arrival city to find cheap flights to New England. I have the best hotel, B&B and resorts in New England recommended on the pages below. A rugged coastline and quaint fishing villages make this an outdoor-lovers ideal getaway. Hiking, biking and exploring are on the top of the list for this gorgeous state. This state has a lot to offer from the exciting city of Boston to the beaches of Cape Cod to quaint small towns and the Western mountains. Boston's Freedom Trail and historical sights, Fanieul Hall, museums, lots of restaurants and more. This is a great city for girls weekends or romantic getaways in New England. This is the perfect place for a beach New England family vacation or a romantic getaway any time of year. Relax on the beaches, shop for local arts and crafts (great for a girls weekend!) and eat fantastic seafood. 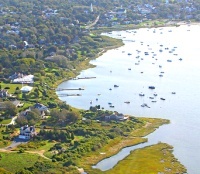 Consider staying in one of these Cape Cod vacation rentals. 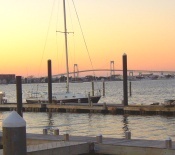 In my opinion, Newport Rhode Island is a top weekend getaway destination. You will find beauty in its harbor, mansions, cliff walk and ocean drive and there is so much to see and do. Perfect for a romantic weekend getaway, girlfriend weekend or summer family vacation! 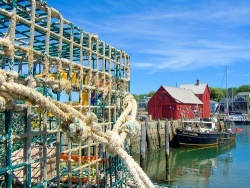 Please share with us here your favorite New England vacations and getaways!